How many of us got our first gun for Christmas? Or our most memorable one? Share the memories here! The Christmas gun that sticks most in my mind was under the tree for me in the year 1960. It was a Colt .45 Automatic. These days, we’re semantically incorrect if we don’t call it a semiautomatic, but hell, Colt called it an Automatic Pistol, and it was the term of the day, and who was a twelve-year-old kid to argue? That set the pistol, a military surplus gun bought for $37.50 in 1960 dollars, on its way under the Christmas tree a few weeks later. Lesson 1: If at all possible, make certain that the gift gun is right for the giftee! Today, almost half a century later and a firearms instructor most of my adult life, I wish I had a buck for every kid/lady/police recruit I’ve met who was given a gun that didn’t fit them for size, recoil, or actual need. With all those dollars, my Christmas gift budget for this year would be taken care of. The pistol, a 1911 model produced in the waning months of WWI, was not alone under the tree. Dad bought me the gun, but Mom bought me a nice new military surplus tanker’s chest holster for it at the Army/Navy Store downtown. My sister ordered me some books about it, including the Army manual, and by Christmas night I was practicing tearing it down and reassembling it. I soon got to where I could field strip the pistol and reassemble it, with eyes closed, in about a minute. My Uncle Whitney bought me a ten-dollar box of new commercial Winchester 230 grain .45 ammo for it…a sinful luxury, since back then we bought GI surplus ammo for half that price in beige boxes at the gun shop or that Army/Navy Store. (And they sold it to kids who had permission notes from parents the dealers knew.) Lesson 2: Guns are big-ticket items. Let other givers chip in. Think ammo. Think cleaning kits. Think gun cases, slings, and holsters, and gift certificates for firearms safety/shooting classes. I still own that ancient Colt .45 Automatic. I carried it in a jewelry store as a kid in the 1960s, and as a young police patrolman in the 1970s. It helped to set me on a career path that has helped some other good people to stay whole in more ways than one. Transferring a lethal weapon between private parties is not as easy as it once was, and I refer you to the ProArms Podcast Number 16, from http://proarms.podbean.com, where you want to listen in particular to veteran firearms dealer Herman Gunter’s advice on how to give a gun to a responsible person you care about in a totally legal way that avoids any accusation of “straw man purchase.” And, when in doubt, we all remind you that a gift certificate from the gun shop is the easiest way to handle such a gift between adults, especially when giver and recipient live in different legal jurisdictions. I wish you all the best of Holiday seasons. Gift certificates make “gun gifts” much easier. 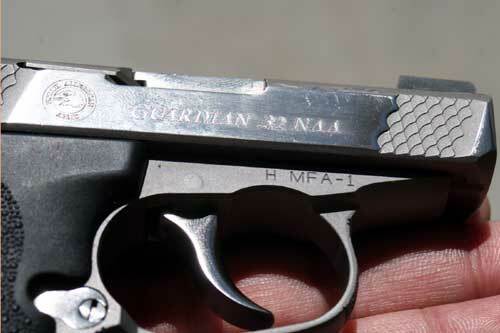 North American Arms is one company that can make giftee’s name or initials into the serial number (must usually be alpha-numeric), but considerable advanced order time is usually involved. A jewelry store can engrave names on revolver’s sideplate or auto pistol’s slide. By leaving those parts, no one at the shop is alarmed and no illegal transfer of firearms possession has taken place. 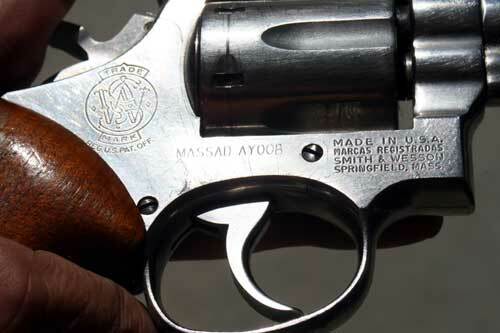 Lettering can be much fancier than this, for gift items; this is author’s service revolver from 30 years ago, S&W Model 66 .357 that shows much use, and name was engraved simply for ID purposes. I’m sure we all will rememeber our first rifles and there will be some great stories posted on this subject. My first gun was a Remington 581S .22 rifle given to me by my father for my birthday. Some of my fondest memories are chasing squirrels through the autumn woods with my father. I will never sell that gun, it is quite accurate and very light. One day I will pass it on to my children. Great Colum Mas! Guns do make a great gift, like…let’s say…a 12ga. Benelli SuperNova (hint, hint…Thanks Honey!). 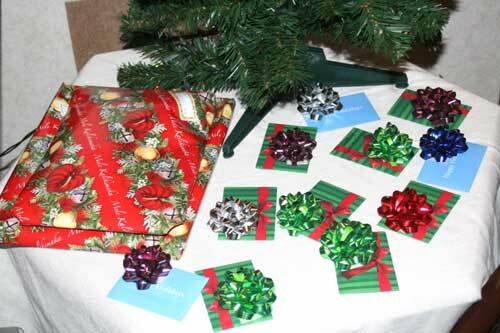 With the price of ammo on the rise, reloading equipment or the ammo itself would also be nice to find under the tree. Ya can NEVER have too much ammo!! Just don’t stuff a stocking that’s hanging on the fire place mantle with it…Doh!!! Christmas, 1956 . . . Mossberg .22 bolt-action. Christmas, 1957 . . . Savage 28-gauge single-shot. Christmas, 1962 . . . Ruger Single-Six convertible. Still have ’em, still shoot ’em. Similar things have gone to my sons at various Christmasses, and the first grandchild got his .22 Remington bolt-action a couple of Christmasses ago. My first gun was a Daisy BB gun patterned after the Winchester model 94. It was a birthday present. Living in rural Maine in the 60’s and 70’s, like most families, we had a .22 riflle (Winchester model 69A) for repelling woodchucks from the garden and porcupines from the fruit trees, and a Winchester model 94 30-30 for deer hunting. My four brothers and I were taught firearm safety at an early age. The two rifles were stored behind the hall door that led to the stairway to the second floor. Dad stored the bolt to the .22 in a seperate location, and the ammo in another location. (We all knew where, but we also knew there were consequences if we touched anything without permission.) I never had a firearm of my own until Febuary of 2007, though my wife had a Remington 870 that we sort of “shared.” Rural Maine is not the same place it used to be. Armed home invasions are starting to become a common place thing. I am resolved to NOT being a victim. We now have a small arsenal of firearms, similar to Mr. Ayoob’s four firearm list in one of his articles. I inherited my Dad’s model 69A .22, my wife’s 20 guage Rem 870 Express magnum, a 1903 Springfield 30-06, sporterized and equiped with Lyman iron sights, and a Springfield Armory 1911-A1 GI .45. For Christmas this year, I got my wife a Glock 19 with 3 mags and a box of ammo. Now all I need to do is get another family member to get her a rail-mount light for it. I don’t know whatever happened to my Daisy BB gun, but I doubt that would be an effective tool for repelling would-be home invaders. I’ve never been fortunate enough to be the recipient of a gun for Christmas, but I am getting a Christmas Present this year. It’s December, and I just found out that I’m going to be off in April for the LFI 1 class. I’m looking forward to it Mas. My employer gave me the time off and my wife is letting me go. This has been twenty years in the making for me, as something has always come up that has prevented me from going. I’ll see you in about four months Mas. I’ll be calling on Monday to sign up. My first rifle was a Savage .22/.410 model 24 over -under. It wasn’t Christmas, but it was the best present I ever received. I could not have waited for Christmas! I was 12 years old. I used it to good effect on the Missouri gray and Fox squirrels. I later made a gift of it to a friends son. He was as thrilled as I was. The first Christmas gun I received came from Mas Ayoob. I have known Mas for many years and for most of my adult life I was a “wheel gun shooter”. When I would help teach shooting classes with Mas, most of the time I would work with the revolver shooters. There was some good natured ribbing about how one of these days I needed to have an “auto” but I would laugh and say I liked my good old reliable S&W Model 15. Never had to worry about it jamming and I could reload it in a heartbeat. So Christmas about five years back Mas bestowed upon me my first semi-automatic. A beautiful Glock 19 with Trijicon night sights and a custom grip that Rick up in New Hampshire did for me. I must admit, I do like my Glock. It’s a quick and efficient weapon and I do like the fact that it holds twice the amount of bullets than my trusty old wheel gun. It was a gift I will always hold near and dear to my heart. Thanks Mas and Happy Holidays !! My Christmas Gun was a Russian M91/30 made in 1943. It was probably reparkerized at some point and the stock is clean, but otherwise it looks, smells and shoots original. It’s decently accurate given the sights and tough trigger. The parkerizing and tool-marks (looks like the cutter on the lathe needed sharpening) make it homely, but special. After making sure I was responsible with his Winchester .22 pump, my father gave me a Browning Autoloader Takedown .22 in the 80’s. It was my first gun and I don’t plan on parting with it. Very light, and very accurate. I plan on teaching my kids to shoot with it. I never got a gun for christmas,although I did get a western field .22 for my 12th birthday which was later stolen.My 7 year old daughter shoots both my ruger 10-22 and and what was her grandpa’s winchester pump .22 regularly.Yes I now have a good safe.